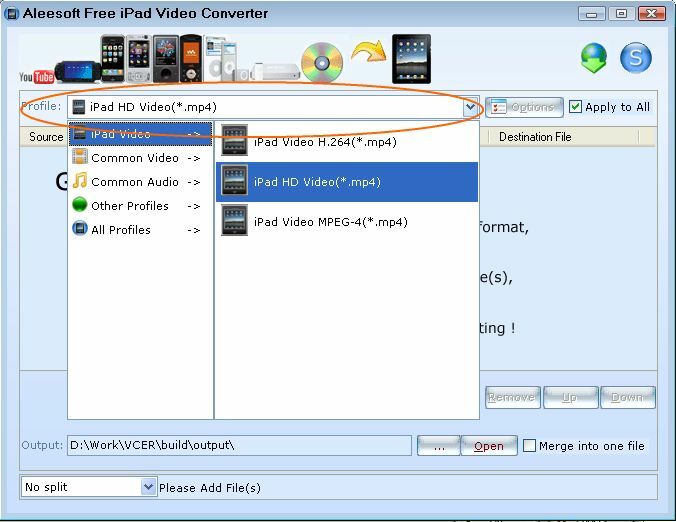 Aleesoft Free iPad Video Converter is a free video converter, This free video to iPad 2 converter can help you convert video to iPad 2 including iPad 2 HD video, MP4, MOV, M4A, then let you enjoy video and music on your iPad 2. How to transfer video to iPad 2? When connected to a personal computer (PC), Windows or Macintosh, the iPad 2 communicates with a piece of Apple software called iTunes. The iPad and iTunes work together to synchronize the movie and music available on the iPad 2 to those available on the PC. This happens automatically, without any intervention being required from the user. After you got the videos converted by a video to iPad 2 converter, connect your iPad 2, launch iTunes and update your library. Once you see your new videos inside the iTunes library, you can easily add them to your iPad. It's pretty easy actually. Before converting video to iPad 2, please download and install Aleesoft Free iPad Video Converter. Step 2: Add video. Click "New Task" button to add video to this free iPad 2 video converter, also you can drag and drop video file from windows explorer into this video to iPad 2 converter. Step 3: Convert. 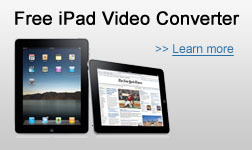 Click "Convert" to start converting video to iPad 2. After conversion completed, you can transfer the converted video file to your iPad 2 and enjoy. Now download Aleesoft Free iPad Video Converter and start to enjoy the movie of your iPad 2.